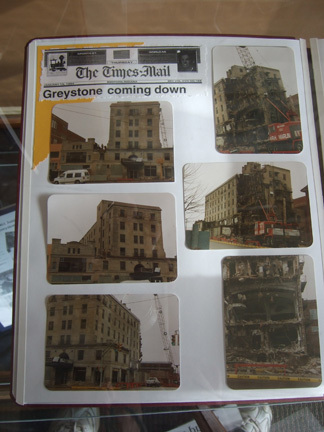 The Greystone Hotel opened in 1923. When the six-story, 100 room structure was built, it was referred to as one of the finest hotels in Indiana. It was demolished by a 3-ton wrecking ball on Jan. 12, 1994. The large photo of the building and almost lifesize reproduction of the hotel sign was created and donated by Johnny's signs. The blanket was donated by Mrs. Jim Anderson. 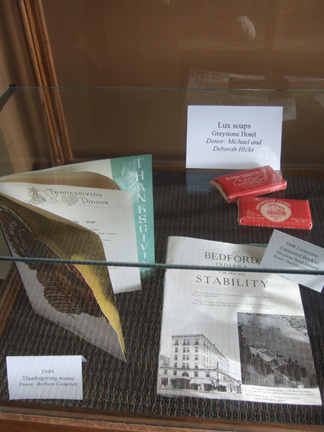 The hotel was the place to be in Bedford for the special events of your life. Stationery from the hotel, and gift bags from the Greystone Gift Shop. A wastebasket from the Greystone Hotel. 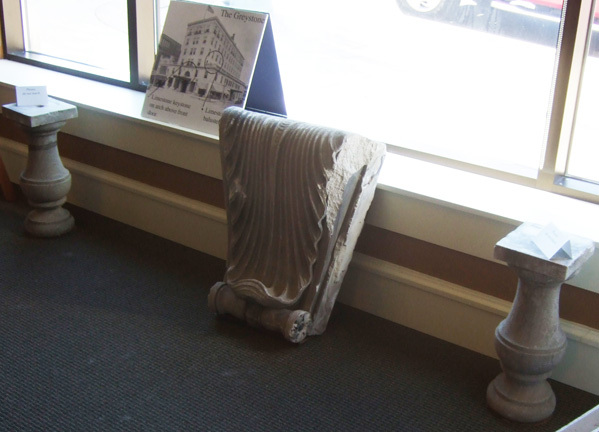 Exterior limestone architectural pieces saved after the building was razed. Jim Buher takes down the sign after the exhibit is over.